If History is to Be Believed, the Answer is No. The Cleveland Browns are the worst team in American sports but this wasn't always the case. And no, this is not hyperbole. The trouble started back in the mid-eighties when the Browns were still a respectable franchise. Their owner, Art Modell, was having some financial issues. Back when he was making money, Modell bought $625,000 worth of land, a plot for a newly renovated stadium. He purchased this land via his company Stadium Corp, which owned the Browns' arena at the time. Unfortunately for Modell, his fortune took a turn for the worse and to ameliorate his debt, he sold the land back to Stadium Corp for $3 million. Then, he sold Stadium Corp itself to the Cleveland Browns, which he also owned, for $6 million. His partner later sued him, and Modell was forced to reverse the deal. With a damaged reputation, Modell and his team absconded to Baltimore in 1996, leaving a football-starved Cleveland behind. After a three year hiatus, the Cleveland Browns were resurrected in 1999, but the new team was, in a word, horrible. While Modell's Baltimore Ravens went on to win the Super Bowl in 2001, the new Cleveland Browns started an era of unprecedented struggle. -13 of 16 NFC teams and 10 of 16 AFC teams have made it to their conference championship since 1999. -There are nine teams that haven't made their respective conference championship since 1999 (Cowboys, Redskins, Lions, Texans (have only been in existence since 2004), Browns, Chiefs, Dolphins, Bengals, Bills). -Of these nine teams, all but four have made it the divisional round of the playoffs. The Bills, Bengals, Lions, and Browns have not. -Of these four teams, only the Bills and Browns have made the playoffs less than four times since 1999. Is this DeShone Kizer, Baker Mayfield, or Johnny Manziel? I genuinely have no idea. The Browns have had 14 starting quarterbacks in 5 years. There's no point in memorizing what they look like. If you looked at the Bills and the Browns from 1999 to 2015, it'd be hard to pick which team had been worse. Yes, you could go back to the mid-nineties and point out that the Bills went to the Super Bowl four years in a row, but that's cheating. Strictly speaking, the Bills and Browns were neck and neck in their competition to become the most embarrassing NFL franchise of all time. From 1999 to 2014, the two teams were 4-4 against one another, and this race to the bottom seemed destined to go on forever. Cue Hue Jackson. In 2016, the Cleveland Browns were in disarray. They'd just released their meth-addicted starting quarterback and someone, in their infinite wisdom, chose to replace him with the perennially injured Robert Griffin III. Hue Jackson was called in to replace Mike Pettine, who had gone an abysmal 10-22 in his short tenure as head coach. From an internal perspective, what happened next can only be speculated on, but from the outside, it looked as the Hue Jackson managed to turn a team that was tied for worst NFL franchise of the 21st century into the worst team in NFL history. Over the past two years, the Browns are 1-31. They've won one game. The Browns are the second team in NFL history to go 0-16, and they almost did it in back-to-back years. Despite the fact that no coach in the history of the NFL has gone 1-31 over two seasons, Browns owner Jimmy Haslam has decided to stick with Jackson, giving him one more chance this year. It's not as if the team doesn't look different now. Josh Gordon has stopped smoking pot, Tyrod Taylor and Baker Mayfield are competing for starting quarterback, Jarvis Landry, in possibly the worst location swap of all time, just arrived from Miami, and Carlos Hyde is set to start at running back. The question is, is Hue Jackson the person to lead this retooled squad, and if so, what was behind Haslam making that decision? Hue Jackson was 1-15 his first year. He's actually gotten worse since he started with the team. After the disastrous 2017 season, most Browns fans would probably consider four or five wins in 2018 a victory, but with the amount of money the team has shelled out in the offseason, it doesn't seem like the front office is aiming for slow growth. That said, whether or not the addition of a few offensive weapons makes a difference depends largely on the head coach, and right now, Cleveland's head coach is the guy who took them from the bottom of the league to the bottom of the NFL history book. No matter who they put on the field, the Browns' playoff chances don't look good if Hue Jackson is on the sideline calling the shots. Maybe the team is cursed. 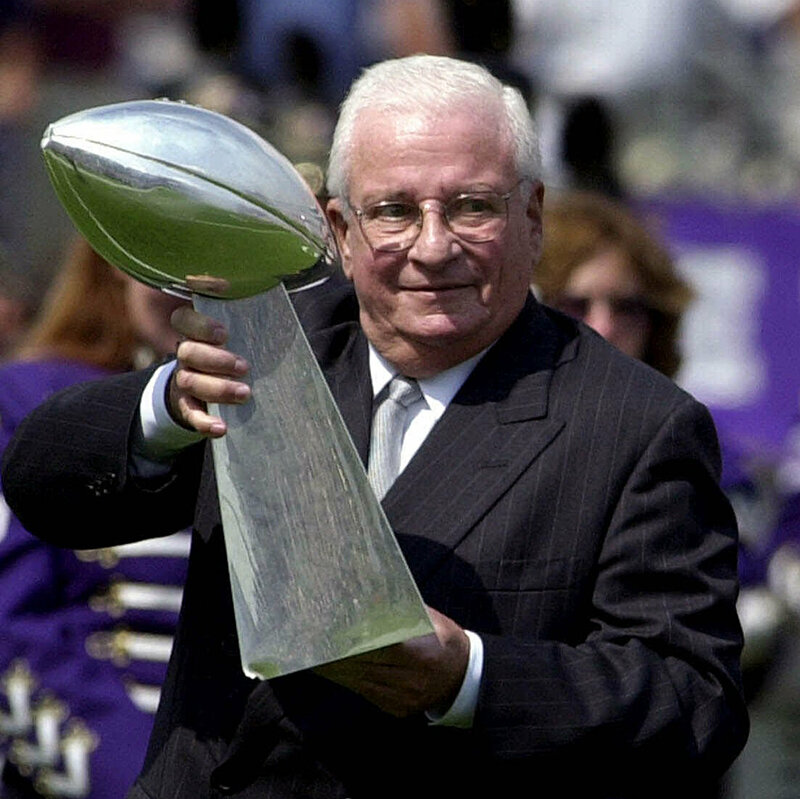 Maybe Art Modell siphoned all of Cleveland's mojo and gave it to Baltimore. It would make sense. The Ravens have had two Super Bowls in the last twenty years. The last time the Browns made the playoffs, Lose Yourself by Eminem was at the top of the charts. If Art Modell's ghost is preventing the Browns from winning, they have no chance. The guy sold his own stadium to himself in order to get out of debt. If Modell laid down a curse, it's probably irreversible. But hey, Cleveland did just win their first preseason game. So maybe this is their year. If not, Cleveland fans can take solace in the fact that the original Browns team is playing in Baltimore, and they've been quite successful there.